Late top story in tomorrow's first-run London papers: in the morning, the Pope is expected to appoint Archbishop Vincent Nichols of Birmingham to the archbishopric of Westminster, the primatial see of England and Wales. A former auxiliary in the capital long seen as the de facto choice for the post, the 63 year-old prelate would succeed Cardinal Cormac Murphy-O'Connor -- the first holder of the job to retire since the hierarchy was re-established in Britain in 1850. Archbishop Nichols, 63, an orthodox bishop who has become more conservative over the past few years, will succeed Cardinal Cormac Murphy-O’Connor as Archbishop of Westminster soon after Easter. He was chosen personally by Pope Benedict XVI after he returned from his recent trip to Africa when the Congregation for Bishops failed to agree on a successor to the Cardinal, who will be the first Archbishop of Westminster not to die in office. Archbishop Nichols will not be made a cardinal for several years because Cardinal Murphy-O’Connor, 77, will retain that role, and the right until his 80th birthday to elect a new Pope. The succession was so fraught, with intensive lobbying for different candidates, that the terna — or list of names — was sent back after the first one failed to pass muster. Archbishop Nichols’s name was the only one on both lists. He has been criticised for his alleged ambition, but his staff have always insisted that he is “ambitious only for God”. One point always made of him is that he is a “thoroughly nice man”. He is unafraid to be outspoken: in 2006, as chairman of the Catholic Education Service, he provoked deep anger among ministers when he forced the Education Secretary to back down over proposals to require faith schools to accept more pupils from non-faith backgrounds. Some thought that Archbishop Nichols might not be considered the best choice by Rome because he was closely identified with the more liberal oversight of Cardinal Hume. He was tipped as a successor to Cardinal Hume and was known to be disappointed that he did not get the job in 2000. But since moving to Birmingham he has won the respect of priests and congregations. 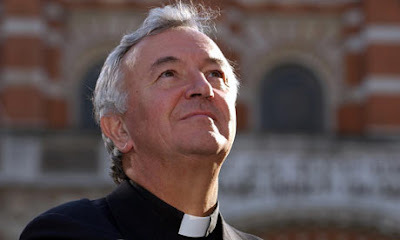 He is thought to have won the Pope’s favour with his support for the canonisation of Cardinal John Henry Newman, of whose work Benedict XVI has made a lifelong study. Archbishop Nichols has good relations with other faiths and is photogenic and comfortable working with the media. When doing the commentary for the BBC’s coverage of the funeral of John Paul II, he was asked by Huw Edwards to describe what was happening at a key moment. “No, Huw. This is an important part of the Mass — we will be quiet,” he said. ...and more from the Telegraph and Guardian. According to the first leaks, an 11am (local) presser is expected to take place at Archbishop's House.